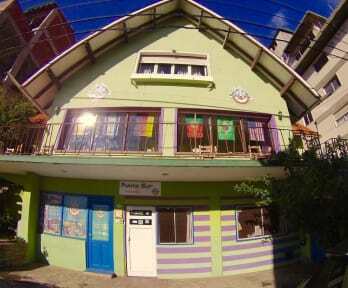 Punto Sur Hostel i Bariloche, Argentina : Boka nu! The total amount of the reservation has to be paid in any case. We may ask for the payment in advance of all the stay. If the group has children, they need to be with adults and those will be responsible for them. Children under 18 can never be left alone at the hostel without a supervising adult. If the groups want to have meals, we can provide them. Please, let us know. Contact the hostel to arrange a payment in advanced of the reservation. Otherwise, the reservation may be cancelled. The amount to pay for the reservation will be the same even if the number of guests or nights is reduced. If there are more guests, please contact us so we can see if we can arrange it. Guests have to be able to sleep in bunk beds. The rooms will be private for the group but they may have to share the hostel with other people. If it is a group bigger than 18, they could have the hostel for themselves, depending on availability. 200 yards from the civic center, awaits Punto Sur Hostel, located in Salta Street with an incredible view of the Nahuel Huapi Lake from all rooms. Come and feel at home! We have dorms and private rooms single, double, triple, quadruple. Except the double private room with double bed, all the rest have bunk beds. All with private bathroom. We have a kitchen for our guests to use and the Living Room with views of the lake where people share good moments and experiences relaxing, playing board games, listening to music, having a beer or eating our amazing asado. Wi-Fi is available for free in all rooms and common areas. IMPORTANT TO READ BEFORE BOOKING: payments at the hostel must be done in cash. To confirm you booking, the hostel needs you to send the CVV code after booking.